One of the few Zambian artists performing in Europe, Namvula has shared the stage with artists such as the legendary South African trumpeter Hugh Masekela, and sitar player Anoushka Shankar, before embarking on her blossoming solo project. Namvula’s music is an intoxicating and unique blend of uplifting global sounds, with the mellow tone of a folk song, the joyful and upbeat rhythms of Africa and a touch of jazz. Crossing boundaries with a refreshing honesty and evocative lyricism, Namvula’s music transports listeners into different worlds, whilst staying firmly rooted in African soil. Namvula was born in Zambia of mixed Zambian-Scottish parents and her songs draw on her Scottish background and African heritage. This blend of African roots, a jazz atmosphere and folk soundscapes has been aptly termed as afro-folk. Dividing her time between Zambia and London, Namvula has started building her reputation in the world music scene with the release of her debut album, ‘Shiwezwa’. fRoots, one of the leading world music magazines, declared that “she’s on the verge of breakthrough” with her “bright, bold and vivid!” album. The Sunday Times thought it was a “contender for debut album of the year”, while The Guardian called Namvula “one of the most original newcomers of the year”. Namvula’s tour also features Liran Donin and Chris Williams, two core members of London-based jazz ensemble Led Bib, and Mamadou Sarr, formerly Baba Maal’s percussionist. Namvula appears at The Apex on Monday 28 September at 7.30pm. Tickets are £12.50, with £5 tickets for those aged under 25. 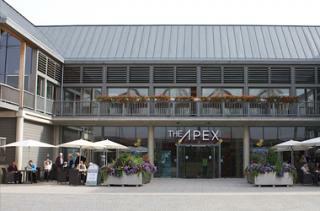 Call the Box Office on 01284 758000, or visit www.theapex.co.uk for more information, or to book.